How are the buses equipped? Yes. All ALPS’ air-conditioned buses are equipped with free WIFI connections, DVD Player, television, air conditioning, reclining seats with headrests, and curtain covered windows. Do the buses make stops? Most buses make intermediate stops to either pick up additional passengers or to drop passenger en route to their destinations. Stopovers are only permitted for BICOL route. Is there assigned seating on ALPS? Seating is on a first-come, first-served basis for Batangas route. However, reserve seats are assigned for reservation on BICOL routes. ALPS strongly prohibits smoking on all of its buses, terminals and booking offices. Are meals provided on board? No. Meals are not provided. Are food and drink allowed on board? Yes. Food and non-alcoholic drinks/beverages may be carried on board for personal consumption. Are radios, laptops, cellular phones, or electronic gadgets allowed on buses? Radios, laptops and other electronic items may be carried on board, provided that they do not disturb fellow passengers and that headphones are used. Any kinds of pets are strictly not allowed on board. Are pillows and blankets available for nighttime travel? No, but you are welcome to bring your own within your carry-on luggage. Does all buses show movies? Yes. All buses show movies en route. Route maps are not available. Does ALPS have discount programs for students? As per LTFRB memorandum circular no. 2009-014, student discounts are only given to non-airconditioned buses. Does ALPS have discount programs for seniors? Yes. Passengers 60 years and older who are able to present a Senior Citizen ID provided by Municipal Mayor can avail 20 percent discount. Does ALPS have discount programs for children? Yes. ALPS maintains a half-price fare for children above 2 years and below 10 years old for ordinary buses only. Does ALPS have any programs for Passengers with Disabilities? Yes, the front right seat near the door are reserved for disabled individual. Does ALPS offer tour programs? No, we only provide bus services. Does ALPS have a policy with regard to unruly passengers? ALPS reserves the right to refuse to transport a person under the influence of intoxicating liquor or drugs or who refuses to comply with any lawful rule or regulations. If you witness any unruly behavior or suspect any trouble with a fellow passenger during your trip, please notify the driver or conductor. How do I locate information for the nearest ALPS terminal? Please check our Terminal page for location details, or check the yellow pages of a local phone directory. Are there discount fares available? Yes. There are discounts available for PWD’s and seniors over age 60. Appropriate identification may be required for these discounts. No, but children seating on the adult’s lap are free. May children travel alone on ALPS? Yes. Any passenger between the ages of eight and 14 may travel. The child must pay adult fare. Does ALPS guarantee its departure and arrival times? No. However, ALPS makes its best effort to provide on-time service, it does not guarantee its departure and arrival times, which may be delayed by any number of factors, including weather, traffic, or mechanical problems. Is the ticket available at the terminal? 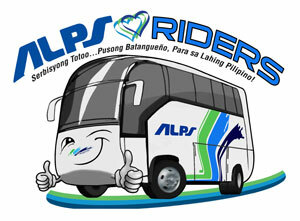 For Batangas route, the tickets are given by the conductor aboard the bus. For Bicol route, tickets are given or reservations can be made on specified booking stations. For Batangas route, refund of ticket is strictly prohibited. However in case of mechanical failure and the bus is unable to continue to travel passengers will be transfered into another bus going to the same destination. For Bicol route, tickets are refundable but 20% of the amount will be deducted against the amount of the ticket to be refunded for cancellation charge. What are the restrictions on carry-on baggage? In order to provide all passengers with reasonable safety and comfort on board, carry-on baggage is restricted to two carry-on pieces per person, both of which must fit either overhead or under the seat of the passenger. However, if the passenger has a bulky baggage it will be put on the compartment of the bus and its corresponding payment will depend on the negotiation between the conductor and passenger. Passengers are reminded to keep their valuables with them at all times. What if I lost my baggage while on board the bus? Any negotiation that will arise regarding baggage the passenger or claimant will pursue his claims to ALPS’ main office. Please call, write, or e-mail us with the details of your trip and the level of service. National Highway, Balagtas, Batangas City. Any inquiries should have a return address or phone number, otherwise it will not receive any response. What information will ALPS’ Customer Assistance need from me? I qualify for a senior discount, but I already bought the ticket at a higher price. How do I receive a refund? You must ask for the discount at the time the ticket was given to you by the conductor or the booker. ALPS cannot provide refunds for discounts requested after the fact. I would like to report a bus driver driving unsafely or a rude conductor. What should I do? Please call, text or e-mail us and report the time and location of the bus in question. I would like to compliment a ALPS employee. What should I do? Please send detailed information to the Customer Assistance Group address above. Include any detailed information about who provided the great service, what they did, and the location or terminal where the assistance was provided. Copyright © 2015 ALPS The Bus, Inc.